In 2011, 2012 and 2013 the Michigan Department of Natural Resources (MDNR) has contracted Niswander Environmental to control and inventory invasive Phragmites (Phragmites australis) at Sterling State Park and adjacent public and private lands in the northern River Raisin delta, Monroe, Michigan. The wetlands adjacent to the River Raisin Area of Concern have been identified as especially important yet impaired due to the negative impacts Phragmites has caused to fish and wildlife habitat. recreation. This project is part of a larger Great Lakes Restoration Initiative-funded project to address fish and wildlife habitat and population beneficial use impairments in the River Raisin Area of Concern. In August and September of 2011, Niswander Environmental conducted field assessments to survey and map stands of Phragmites according to size and stem density using handheld GPS receivers. Detailed data from these surveys were downloaded into a GIS database and distributed to the MDNR, providing them with accurate and up-to-date inventories of current locations of invasive vegetation so that future management plans could be effectively developed. Over the course of the contract, Niswander Environmental surveyed 28 zones containing known locations of Phragmites. The perimeters of these stands were walked and/or driven utilizing off-road vehicles, and population estimates and densities were recorded. 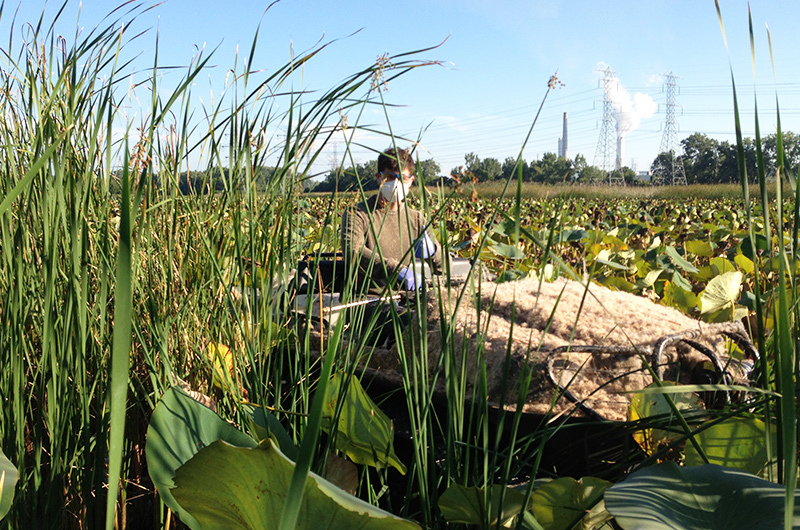 Following the mapping portion of the project, Niswander Environmental treated the stands of invasive vegetation with an aquatic-safe combination of herbicides designed to systemically suppress the Phragmites. The work was accomplished by applying herbicides using ground-based application techniques, by a combination of foliar spraying and hand-swiping herbicide onto individual plants. The application methods depended largely on the size and density of the stands. For example, off-road vehicles such as an Argo or ATV were utilized for large stands with simple access, backpacks were necessary for small treatment areas with limited access, and a john-boat was used on several occasions for treatments along the shoreline of Ford Marsh. In total, over 1,100 acres were chemically treated by Niswander Environmental from 2011-2013.